The most requested meals at our house are those that are some kind of taco inspired dish. So you can imagine I need to come up with a lot of different recipes to change things up. 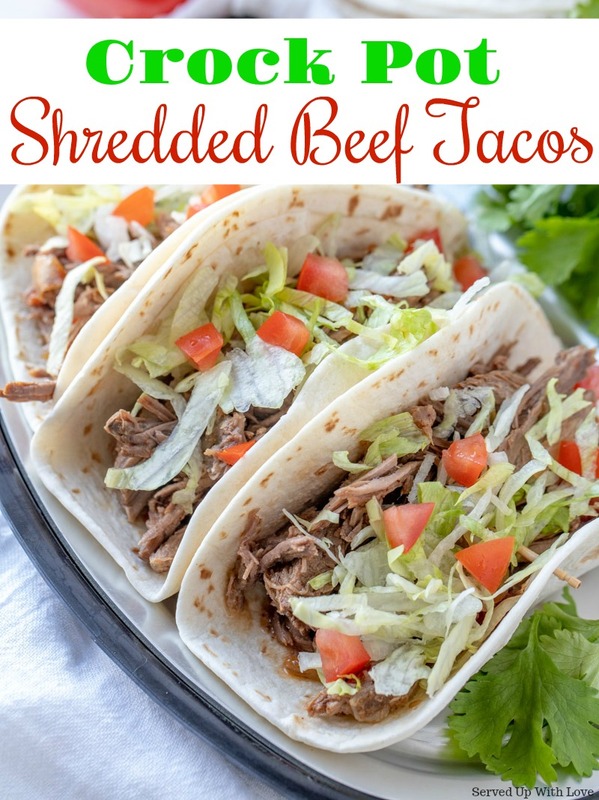 These Crock Pot Shredded Beef Tacos have become my new favorite. The recipe happened kind of by accident. Once a month we head to a warehouse club to buy the bulk of our meat when we are able to fit it into our budget. It had been a long day of shopping so when I separated the meat to freeze I forgot to write on the freezer bag what was in it. Normally I can figure out what it is but this particular time, we only had smaller bags so I had to ram it all in. So fast forward to a day I decided we were going to have steak on the grill. I grabbed the package of steaks out of the freezer. As it thawed I soon realized I had grabbed a smaller beef roast. Ok, now what am I going to do with this? So I grabbed the correct package of steaks out the freezer to thaw (cause this moma wanted steak) and put the roast back in the fridge until the next day. I grabbed the crock pot and started loading it on up. I wasn't in the mood for our normal Crock Pot Roast Beef (one of my favs!) so I let the wheels turn in my head trying to figure out what to make. As I searched the pantry to see what I could throw together, it was like an ah-ha moment when I saw the can of rotel. Tacos it is! 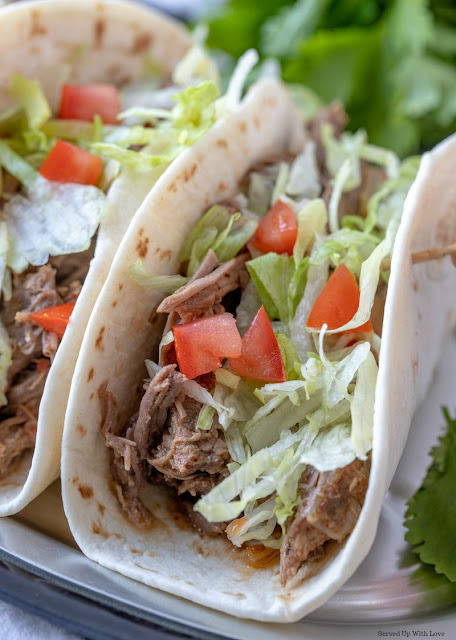 If tacos tickle your fancy, you have to try these Crock Pot Chicken Tacos, Taco Pie, and grab the chips for the Taco Dip . 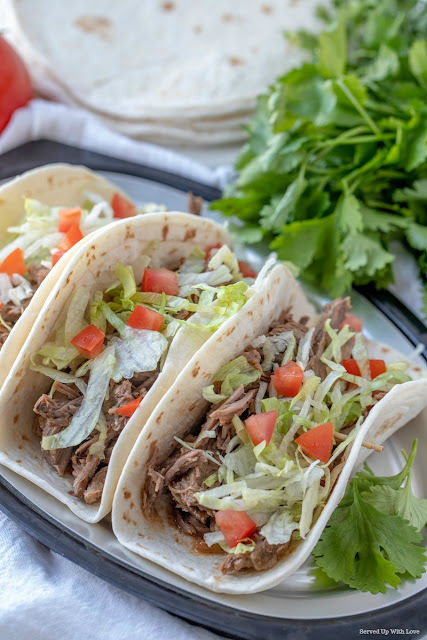 Kick up your Taco Tuesday with this Easy Crock Pot Shredded Beef Tacos recipe. Slow cooked to perfection. Grab the toppings and dig in. 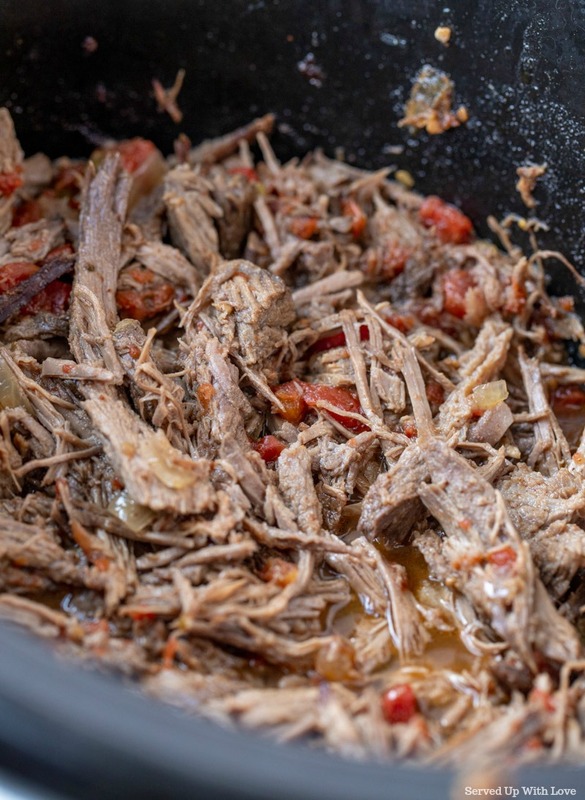 Cook 8 hours on low in your crock pot. Once done, shred with two forks. 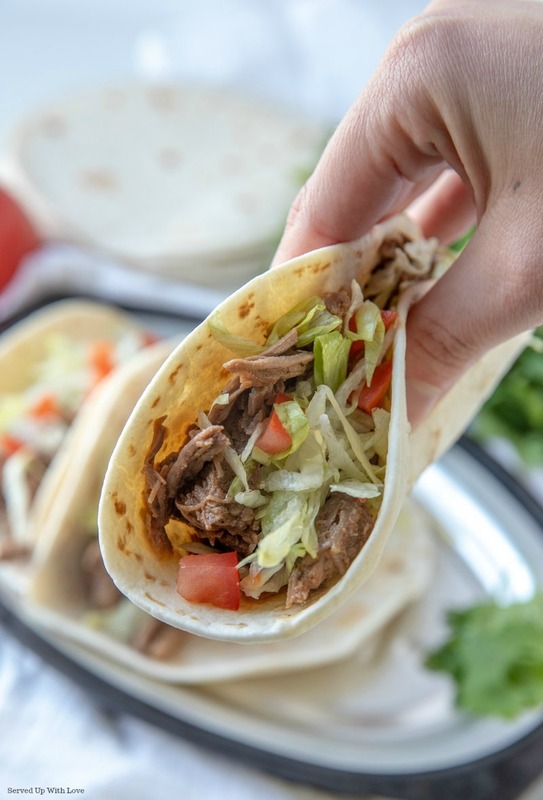 Add into tortillas and add your favorite toppings. Add your favorite toppings - salsa, pico de gallo, guacamole, sour cream, shredded cheese, chopped cilantro, lettuce, tomato, etc. How long and at what temperature do you cook the beef? That was an important step that I completely left out huh? I have updated the recipe to show 8 hours on low. Thanks for pointing it out so I could fix it! Would a beef chuck roast work? Is that what you would recommend? Yes, that is what I used for this recipe. Hope you get to try it soon. Could a pork shoulder roast be used? Oh yummm! I love your creative mind. This sure sounds tasty!! I'm in Nova Scotia and we don't have Rotel tomatoes here. I'm presuming they are chill flavoured. What size is the can? I'd like to see what I can use here to substitute for them as this sound yummy! Thanks! There has been something very similar here that should work. If I can't find that, I'll use this recipe instead to do my own. 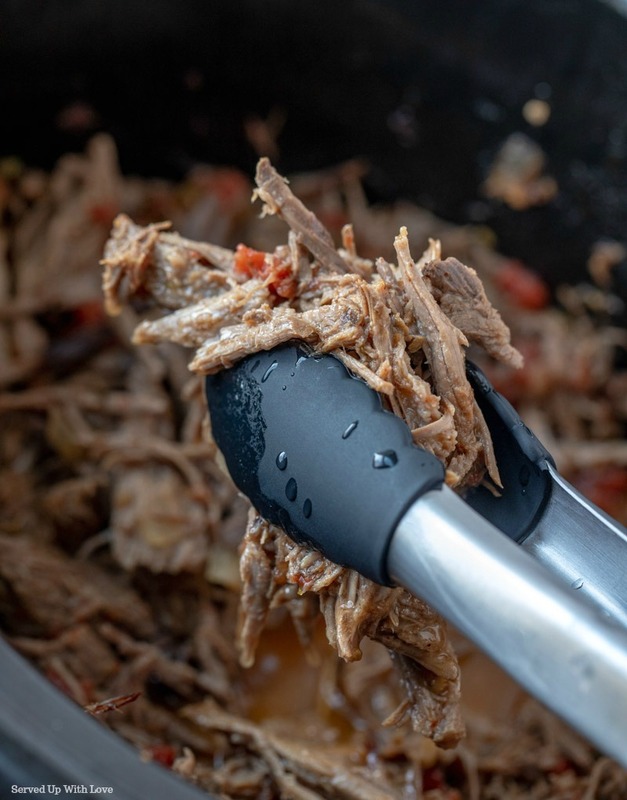 It's totally crockpot season! Especially because my evening walk is ending around sunset! Thanks for the inspiration! looks good do you add any water? Going to try this one! Thanks! I spend a more time trying to figure out what to cook for dinner then I actually do cooking. I just printed a coupon for tortillas at www.frugalharbor.com. I will be making this as soon as I get to the store. Thanks again! It would really depend on how big your roast is and how much you fill your tacos. I would estimate about 10-12 servings. We ate on this for a couple of nights. Hope that helps.